The information detailed below gives you an idea of the expectations of online learning, as well as ways to determine whether it is your best option. One of the easiest ways to determine a good fit for you is to participate in the online readiness self-assessment. The feedback is immediate and helps you to gauge your readiness for online learning, whether or not you choose La Verne. 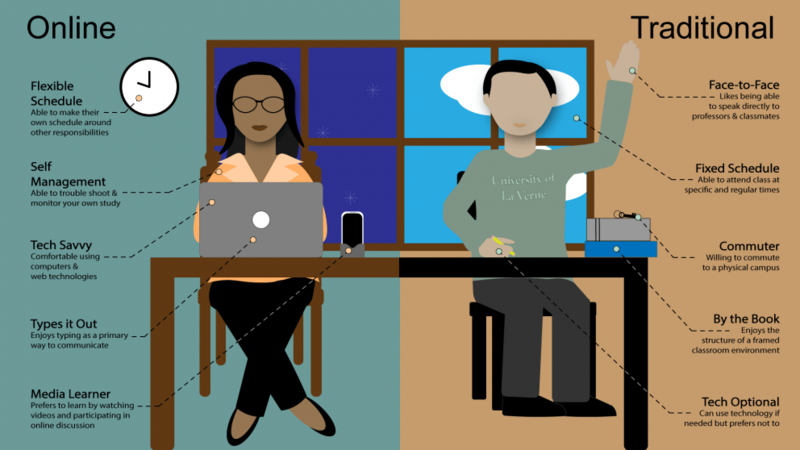 Online classes require different skills to succeed than face-to-face classes. It’s important to know what you’re getting into and to know what to expect before you get started. Education is a huge commitment of time and resources, and choosing the right campus is important. The infographic below depicts some of the differences between online and traditional education. Click on the image to make it bigger. This brief chart compares and contrasts the similarities and differences of traditional campuses and their online counterparts.